Optical biosensors for the detection of toxic species in aqueous media were developed via the encapsulation of microalgae in sol–gel matrices. In a first step, the effect of cadmium(II), lead(II), and anthracene on the chlorophyll a fluorescence intensity of Anabaena flos-aquae, Chlorella vulgaris, and Euglena gracilis microalgae in suspension was studied. Complementary ATP-metry measurements demonstrated a direct relationship between optical response and pollutant toxicity, in a cell- and dose-dependent manner. In a second step, microalgae were successfully encapsulated in silicate–colloidal silica nanocomposite matrices. However, a complete loss of cell response to pollutant addition was observed, despite the preservation of cell viability. Introduction of a low amount (5 mol%) of amine- or ethyl-bearing silanes in the matrix formulation allowed the recovery of the sensing capacity of the immobilized microalgae, without impacting on the response time (30 s). Porosimetry and 29Si solid-state NMR spectroscopy showed that the organic moieties are fully integrated into the inorganic network, tuning the ability of the target pollutant to diffuse and reach the encapsulated algae. This versatile strategy could be useful for the easy and fast assessment of contamination levels in polluted waters. 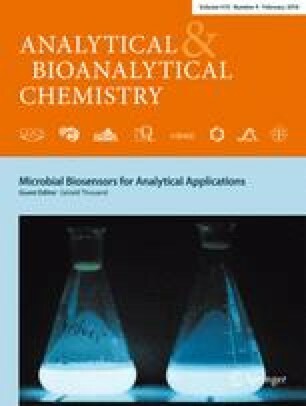 Published in the topical collection Microbial Biosensors for Analytical Applications with guest editor Gérald Thouand. The online version of this article (doi: 10.1007/s00216-017-0405-8) contains supplementary material, which is available to authorized users. N.B.’s PhD studies were funded by the French Ministry for Superior Education and Research. The authors thank G. Thouand (GEnie des Procédés Environnement - Agroalimentaire (GEPEA), Université de Nantes) and B. Lebeau (Institut des Sciences des Matériaux de Mulhouse (ISMM), Université de Haute Alsace) for fruitful discussions.